Sigh...I *still* haven't quite finished printing CP Mk1, and you're already up to CP Mk3! I seriously think that's it now for Cherry Pi. It's a great printer, easy to build and relatively cheap. I've started to work on a new design now that uses the core XY transmission system developed by MIT. The prototype is up and running and I think it's the way to go in terms of low part count, small footprint and (very) high speed. The small, rigid frame gives very accurate prints and using a bowden on the X carriage means very low intertia, less even than a delta. My prototype is on Thingiverse ( [www.thingiverse.com] ). I still have some wrinkles to iron out in terms of the moving build platform, it's not as stable as I would like. That said the print quality and speed are the best I've ever achieved with any sort of printer. Not as cool to watch as a delta though!!! Nice design, if not for the bolt heads you need to drill to fit the magnets. Are there any alternatives to them, for magnetic coupling? They are really easy to do. I have a pillar drill and I made a simple jig. Just a piece of 3mm mild steel with an M5 hole tapped in it. I clamp this in the drill vice and can make a full set of 12 rod ends in about 15 minutes. I do know a couple of people that have used a hand drill and a normal vice. The 10mm ball end cutters are available for about £5.00 on Ebay. You only need to take a minute amount of metal from the head to form the cup for the 10mm spherical magnet. Looking round the forums I have seen other types of magnetic coupling and I've tried a couple. For me, the way I do it now is the best way. I made two sets of 1/2 inch (~13mm) cupped rod ends using a cordless drill holding the rods in my hands with the cap screws installed. My CNC-grade ball end mill bit set me back $45 (tool truck price) since I went with 1/2 inch spherical magnets, but the process it self was simple and painless. Oh snap... atleast, it's almost the same part as the II (Most of change are the Printed Parts?). I'll update my files for this one! Glad I didnt print already! Edited 1 time(s). Last edit at 06/02/2014 05:05PM by nka. Edited 2 time(s). Last edit at 06/02/2014 10:14PM by nka. I just like how clean and organized it is. If I ever build a Delta, either this will be it or it will be my basis. Realizer- One who realizes dreams by making them a reality either by possibility or by completion. Also creating or renewing hopes of dreams. What firmware do you use into the RAMPS? Marlin? Also, I would like to add a 25mm (I took the mesurement of the Sunon MC25101V1000UA99) fan for the J-Head as it seems recommended for PLA. I would hook it only on the bottom (red arrow) ? Does it make sens to you? I'm asking cause, since I dont have the printer yet, it's hard for me to figure how it will fit. Plus, it will be printed in ABS and I wont be able to do it with the printer. Or something like this, were I could "clip" the fan? Edited 3 time(s). Last edit at 06/04/2014 03:04PM by nka. I'm curious as to how you machined the bolt heads with the ball head mill. I was looking at magnetic arms for a MK but they used cylinder magnets in the arms with steel balls on the effector and carriage. Your way seems cleaner to me since it seems like it would have more surface area for the the attraction between the parts and be easier to assemble. I have a feeling my MK will be busy making parts for one of these once I get it going. I wanted to scale up to a 250mm build surface and 2020 extrusions anyway. 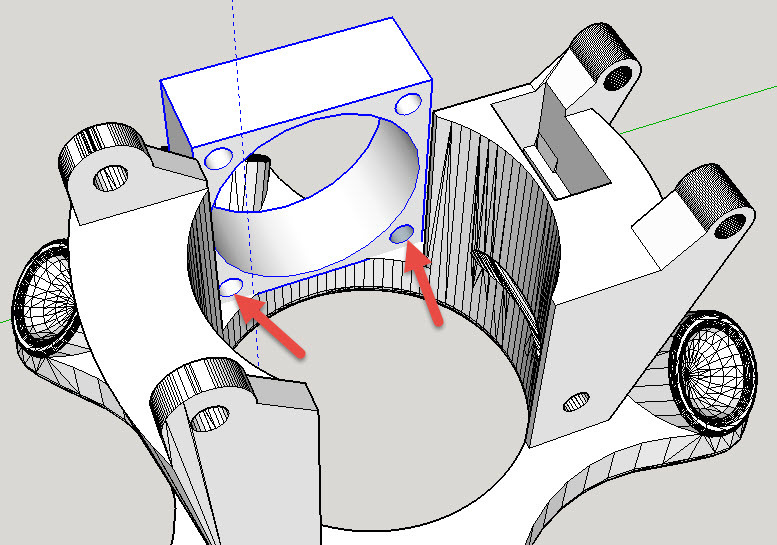 Would the Misumi 2020 be an adequate substitute for the Bosch/Rexroth extrusions? I already have some 360mm and 750mm handy. Edited 1 time(s). Last edit at 06/04/2014 03:30PM by WZ9V. I dont where I read that, but he used a steel plate with M5 taps. Placing the bolt into the tap and them using a column drill with 10mm drill bit doing a small cup hole. I'll be doing this next week (or maybe Friday). I'm currently doing the M6 tap into the pipe. And I hope Misumi 2020 are working, cause this is what I've ordered! I use Rich Cattell's version of Marlin as this has a great auto calibration function. As far as the fan goes, I have never needed one for my Jheads but if you use one just attach it to the effector with a dab of high viscosity CA. It's great stuff. You may find that the effector magnets stop the fan from turning. Some fans seem more susceptible to this. Edited 1 time(s). Last edit at 06/04/2014 06:04PM by AndyCart. They do work really well. I made a simple jig out of a scrap piece of 3mm mild steel bar. Just tapped a M5 hole in the middle of it. The steel is then clamped into my pillar drill vice. I put a 3mm round rod into the drill chuck and line it up so that it goes into the Allen socket of the M5 SHCS. I use BZP screws. Once the screw in the jig is lined up with the centre of the drill chuck I replace the 3mm rod with the 10mm ball end mill and just unscrew the SHCS when it's been milled and screw in another, etc. takes about 15 minutes to do all 12. The edge of the 'cup' is sometimes a little bit sharp so I normally smooth it's edge on my scotchbrite wheel as well. Dead easy. You only need to mill to the edge of the knurling on the screw head and this leaves half of the Allen socket free so you can use an Allen wrench to self tap the rod end into your 5mm ID aluminium tube rods. Thanks, sounds like I could easily do it with my drill press based on the descriptions. The sad part of this Endmill is cost vs usage. I dont think I will ever use that again ! Yeah, I mostly will do this. Or sell pre-milled bolts and magnet as a package. I will have too many of them anyway ! Seems that the Extuder Body isnt "flat" on the surface. With Cura, you can do "Lay Flat", but not with Slic3r or Simplify3D. 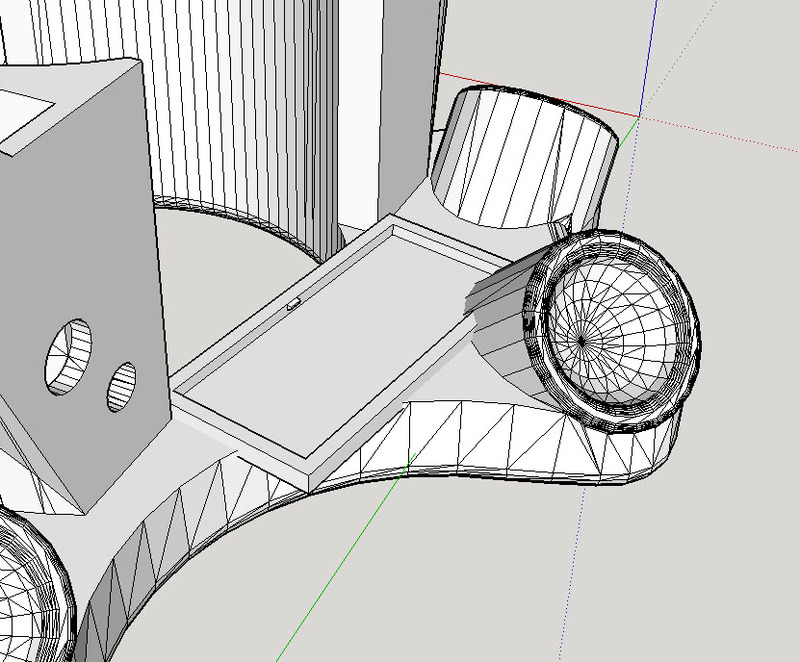 I dont have the SketchUp file, can you just align it and reupload? Mine was fine. I will upload it again though. Maybe a rogue file slipped through. Here are the results of my failed experiment. My current Delta RepStrap uses 1/2 inch (12.7mm) spherical magnets with cupped steel SHCS on the ends of the rods as the sockets. My initial thinking was that I was going to toss some leftover 5/16" steel spheres into the CP-I's effector plate sockets loose, then put my current rods on top of them for testing. Sure, there would be slop, but it was only a proof-of-concept. I changed my mind, and decided instead to use CA to attach 1/2" plastic spheres to the sockets using CA instead, and then use my existing rods on the plastic spheres. After the third rod, the effector plate kept wanting to twist from the shock cord tension, so I had to dedicate a hand to holding it straight from then on. On multiple attempts, I was trying to insert rod #5 when one of the others would fall out and hit the floor. Since that meant letting go of the effector plate to retrieve it from the floor, I had to start over from scratch. I'd post pictures or video, but you can Google "keystone cops" for a better slapstick comedy routine. Oh well. It's fun trying new things. Like you I've decided it' easier to just buy the magnets. Currently I'm getting them as a block of 64 from China for about £16. They are marketed as an executive toy but they are just 10mm neodymium spheres so perfect for our needs. Core XY kinematics has me hooked at the moment. Very promising in terms of print quality and speed. If I did not have $50 USD invested in the 1/2 inch ball end mill bit, I would be converting to 10mm spherical magnets. When I went to re-order last night, my source for $1.69 magnets no longer carries 1/2" and does not expect to stock more! I had to pay $2.49 each from a second source, with the third source being an insane $3.66 each. If I wind up doing a third printer, it will be on 10mm toy magnets and I will have the buy a new bit for cutting 10mm cups.